Planning your first trip to Walt Disney World can be a little overwhelming. Don't worry with a little advance planning and research you will be able to enjoy a magical vacation and learn why it's called "The Happiest Place On Earth". While the words "We're going to Disney World!" are still magically ringing in your ears start planning. There are a plethora of great trip planning resources on the Internet that you'll find extremely helpful in making your itinerary. You can find my personal favorites and trip planning articles throughout my blog. The Disney online community is jammed packed with information. Visit, ask questions and take notes. Choose your dates wisely. You may want to check out my friend Dave's Walt Disney World Week Picker. He's analyzed each week for crowd levels, weather and a whole host of other variables. You can find it HERE. Knowing when and where you'll be on any given day is half the planning battle. Visit the official Disney World website and become familiar the lay of the land world. You can even print out your own personalized park maps and order a free DVD. We've been collecting them for years giving you a look at what you can expect on your first visitor. Ask questions of the Mom's Panel, make note of park hours, times for each of the parades and shows in the parks you'll be visiting and ride height requirements for children. Become familiar with the FastPass system. Download My Disney Experience and Mobile Magic from iTunes. Both apps are available for iPhone and Android. I found them very helpful on my last trip. I was staying in 3 resorts over the 10 day trip and having the resort info, dining reservations (ADR) in my phone was very helpful. Read up! Check my Bookshelf for a list of guides, general information and touring plans. Don't live by the guide book though. Take in the information and add it to your plan. Always have an alternative plan in mind. I know it sounds counter intuitive. When we travelled as a family on our first trip more than 20 years ago I had an itinerary for each day. That was fine for the first few days but then we started going off the plan. It was fun and I have many memories of unexpected magic from the trip. So, my advice is bring the guide but be your own guide and have fun with it. Buy Park Hopper Tickets. You'll want to visit more than one park a day. Don't miss Wishes, pictures above. It's a nightly spectacular fireworks display in the Magic Kingdom. Rent a stroller even if your little one isn't using one at home. The park maps are not to scale and walking long distances for all ages in the Florida heat can be taxing. If renting isn't in your budget, check out the DISboards. Quite often there are stroller swaps going on that you may be able to participate in. While you are there check out all the planning boards for some great tips. Say hi, if you spot me, DebºoºS on the DIS. Go with the Disney Dining Plan on your first visit. It won't always save you money but it will allow you to know how much to budget for food ahead of time. 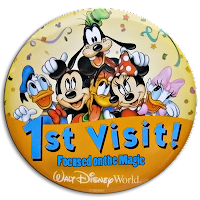 Be sure to ask for your 1st visit button at any Guest Relations desk in the parks and in the resorts. 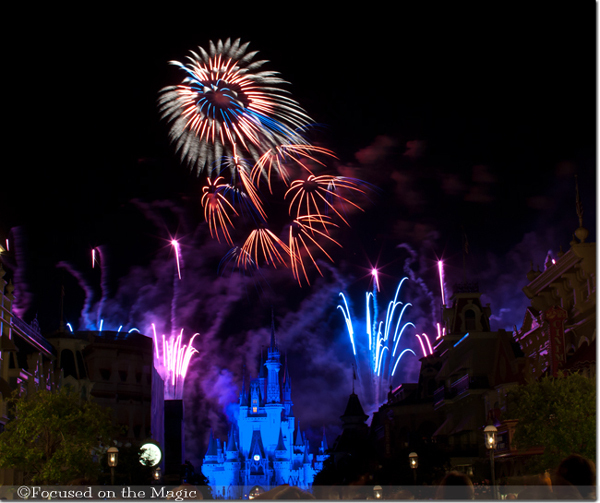 As a Disney fan photographer my favorite tip of all is to bring tons of memory for your digital camera and shoot away! Take pictures of everything and everyone! For more of my photography advice for Disney World please stop back sometime and visit HERE. Love the tips Deb, I couldn't agree more about the park hopper and visiting the WDW site. I use that very often. Plan, Plan, Plan - that should be a button too. And for strollers, rent off site as the price is better and they deliver and pickup.